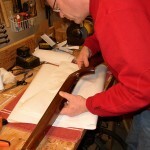 This is how I repaired an obviously serious break in the stock of a 1956 Winchester Model 88 rifle (1) using a WEST SYSTEM® 101 Handy Repair Pack. 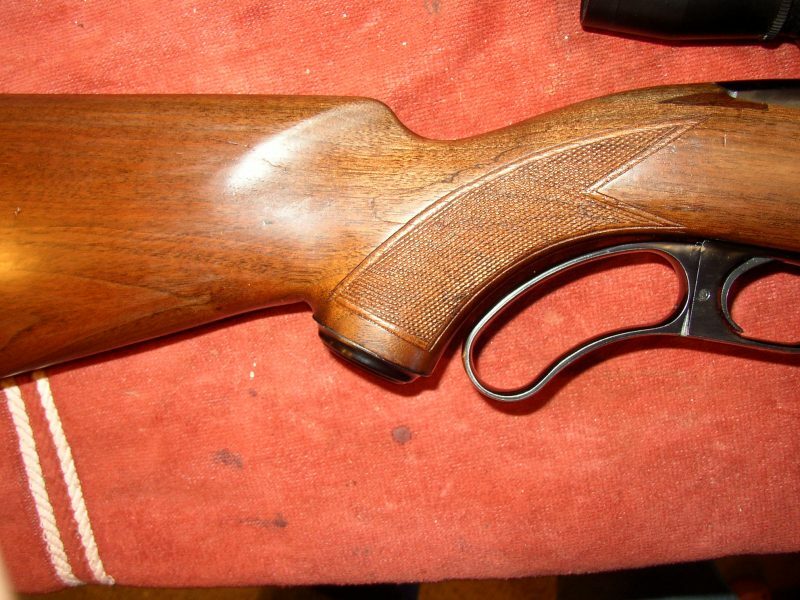 I soaked the broken ends in acetone for about 5 minutes and brushed with a tooth brush a couple of times to remove any gun oil from the wood surface. Besides the breaks, the grain on the back stock splintered (2). I started with the major breaks first. I mixed some walnut sawdust with a mixture of 105 Resin/205 Hardener and added a little 406 Colloidal Silica filler. I gave all of the surfaces a thick coat of epoxy (3). 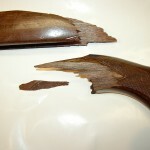 The 30 minute working time was needed, as aligning some of the splinters in the checkering was difficult (4). It was tricky to get clamps to hold. The surface is round, the epoxy is slick, and I used plastic wrap to keep the clamps from adhering to the stock (5). With the stock back together, I put a 105 Resin and 205 Hardener packet in warm water before mixing to increase its flow rate. 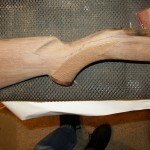 The mixed epoxy was poured into the raised grain cracks and then lightly clamped (6). The repaired raw stock came out looking very good. I used dental tools to clean up the checkering and used furniture stripper on the old polyurethane finish. 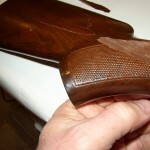 A fine sanding with 400 grit paper completed the stock preparation (7). I sealed the stock with 20% tung oil and 80% mineral spirits. Then I sanded it 6 times with 50% tung oil and 50% mineral spirits. I waited 1-2 days between each application and sanding. Lastly, I used rubbing compound to knock down the gloss and bring out the satin finish (8). After one box of shells, the finished stock is still holding solid. The worst side of the break and the repairs look great. I don’t think it could look any better given the nature of the breaks. I am very pleased with the outcome. 1. 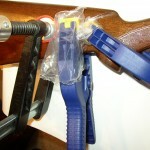 The shattered gun stock to be repaired with a WEST SYSTEM 101 Handy Repair Kit. 2. Besides the breaks, the grain on the back stock splintered. 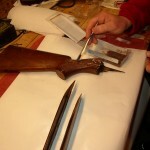 4. aligning some of the splinters in the checkering was difficult. 5. 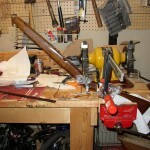 I used plastic wrap to keep the clamps from adhering to the stock. 6. The mixed epoxy was poured into the raised grain cracks and then lightly clamped. 7. A fine sanding with 400 grit paper completed the stock preparation. 8. 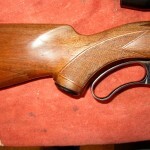 I used rubbing compound to knock down the gloss and bring out the satin finish.